Right, after a lengthy Twitter conversation involving the lovely @knuckle_salad, I figured I’d do a post or eight-hundred aimed specifically for the new fans of Doctor Who, the ones who came in some time in the last six or seven years and know little to nothing about the original series. Now, if you have no interest in the original series, that’s fine. I don’t know what the heck you’re doing here reading this, but it really is fine. We all have different likes and dislikes. For instance, I love the original series of Star Trek, I think Next Generation is mostly good, I adore Deep Space Nine once it gets moving, Voyager was like having my mouth washed out with chunky diarrhoea, and Enterprise was one of the worst screwed up opportunities I have ever seen, except for Season Four which was really clever and interesting. Point is, different things appeal to different people. Despite the claims of some fans, you’re actually allowed to not like the original series of Doctor Who. It’s not a perfect series. Its strength was always story-telling, characters, and ideas. But some stories are severely lacking in one or more of these elements. Also, huge chunks of the first six years are missing. There are some television shows from that era where nothing at all exists. Where Doctor Who fans are unbelievably fortunate is that all the missing bits still exist on audio. And while audio isn’t an ideal format for some stories, it’s better than nothing at all. We also have telesnaps  from some of the missing episodes, so combined with the audios, we can hear and see what was going on. Again, it’s not ideal, but we’re very lucky to have even that. I think I’ll try recommending some stories for new Doctor Who fans next time around, unless someone out there throws me a topic too yummy to resist. Which is very likely. So don’t wait for the list, but if you have questions, write to me and I’ll do my best to answer them without lying too much making too many errors. But this time I want to talk about the Daleks. There are a lot of people who simply cannot understand the fascination with them. They’re short little robot  dudes. 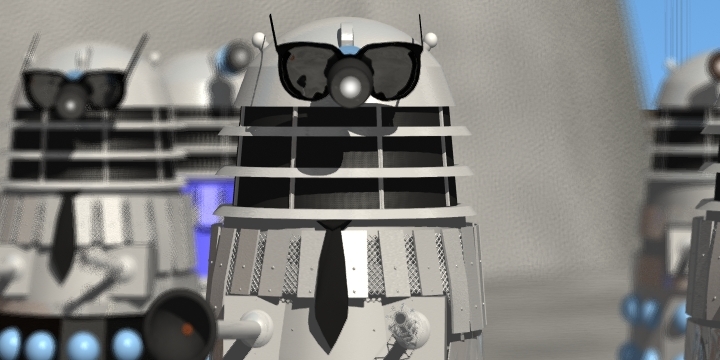 What is it about the Daleks that made them such a success right from the beginning? Okay, to address this, you have to try to understand where they come from, from a media and cultural perspective.